The alpine world is fraught with risk: loose rock, unpredictable weather, avalanches and crevasses. To manage these risks, many climbers appeal to the "speed is safety" adage. By traveling light and fast, we hope to maintain a large enough margin of safety while pursuing our alpine objectives. It's with these concepts in mind that Salewa built the Apex 22. This compact climbing pack has a tapered shape, minimal compression straps and zero extras. I tested it on single and multi-day trips and during a nine-day AMGA Alpine Guide course in the Cascades this summer. The pack's cut, wide at the shoulders and narrow at the waist, carries the load evenly, hugs my long, narrow torso and moves with me. Both the shoulder straps and hip belt are lightly padded with soft, breathable mesh to wick perspiration. The hip belt is as wide as a dollar bill and has a single gear loop on either side. The buckles on the hip belt are postage-stamp width yet operable with gloves. Unlike many other packs that have two ice axe head clip-in points, the Apex 22 has only a single attachment point. This design causes the picks to jut out on either side of the pack and snag on the rock when climbing through tight chimneys. Another side effect of the pack's slimmed-down design is it lacks a crampon pouch. This doesn't mean the pack can't carry them: To lash crampons onto it, I tied 4mm cord to the two parallel tie-in points on the pack's exterior. Looking at the pack from above, it resembles the inside of a stuff sack with a few straps sewn on the outside. Inside it there is only one zippered 6"x7" mesh pocket that holds keys, energy gels and a bar. The pocket is too small to carry much more; if you're bringing a map and compass, cell phone and GPS, you'll have to stash them elsewhere. And, while there's a hose portal for a hydration system, there's no sleeve or hook to hold up the reservoir. This pack's clamshell design opens with a single zippered entry point at the top of the pack. While this gives the Apex its sleek appearance, it does limit packability. At 22 liters, the Apex is geared toward single-day objectives, although with careful packing it can work for three-day outings and can fit a sleeping pad and bag, bivy sack, stove and fuel, food and water, first-aid kit, SAT phone, clothes and some climbing gear. Overstuffing this pack repeatedly didn't damage the zipper. The Apex 22 has a removable Internal Support Board (ISB), a thinly lined sheet of plastic acting as a frame. Removing this sheet allows the pack to fold up and be carried inside a bigger pack. The pack is made with nylon-coated polyacrylate to make it water repellent. And though it has a waterproof zipper, the pack's seams are not sealed, which would otherwise make it waterproof. Whether considered waterproof or water resistant, on more than one occasion I was caught in a downpour with camera gear inside that stayed dry. Additionally, the pack dries quickly. After dragging the Apex 22 around the Cascades, up choss chimneys and through multiple storms, the pack didn't tear, leak or show signs of wear other than a few rough spots. Though it's a niche pack, I'll be using it for many more adventures—alpine and otherwise. *	Light, strong and compact for alpine climbing. *	Tapered and minimalist design fits comfortably and moves with the body. *	Fabric sheds water reasonably well and dries quickly. 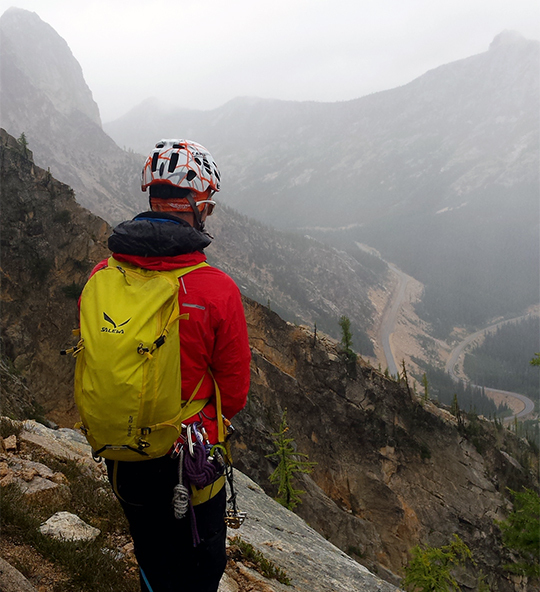 *	Removable internal frame facilitates good packability for use as a summit pack. *	Inner pocket is too small. *	The centrally located ice-tool carrying system is cumbersome.